Some airports operate simultaneous take off and landing on parallel but close runways. By close, I mean like the pairs of runways at LAX. What if a landing aircraft makes a go-around at the same time as another aircraft takes off? How is separation maintained? Would it be enough for the missed approach procedure to specify turning away from the departure runway? The first thing I would point out is that LAX isn't going to be running simultaneous approaches on 24L and 24R or 25L and 25R. They'll select one of each of the parallel sets for the landing runways (typically the outer runways), and one of each for departing runways (typically the inner runways). For example, they might be landing on 25L and 24R and departing 25R and 24L. So, there's quite a bit of distance between those runways, and very little risk in a go around situation. The second part of your question about an aircraft taking off at the same time as a go-around certainly happens, and when it does, ATC needs to take action to ensure safety and separation. ATC separation requirements can be satisfied by altitude, distance, or divergence (and, in some cases, visual contact). In the situation you described, divergence is the quickest and safest way to achieve separation. I believe the requirement is 30°, so tower would typically order a go-around and order a new heading at least 30° off of runway heading. The geography of the area, layout of the airspace, and the approach patterns would likely dictate the exact procedure used at each airport since their two primary goals, in order, are going to be 1. safety, and 2. getting them back in the approach sequence. In the LAX example, a go-around on 24R would most likely get a right turn, and 25L would most likely get left turn (away from the airport) so as not to conflict with other departing or arriving traffic. This is one of a few reasons the outer runways are preferred for landing. Take a look at both ILS approach charts for Munich's runways 26L and 26R1, which are parallel runwawys. Both ILS instrument approaches terminate at the Missed Approach Point (MAPt). You can see from the charts that the Missed Approach for the northern runway 26R mandates a right turn to the MIKE (MIQ) NDB after passing 1.0 DME of the Munich (DMN) DME. You can see from the charts that the Missed Approach for the southern runway 26L mandates a left turn to the Munich (MUN) VOR after passing 1.0 DME of the Munich (DMS) DME. 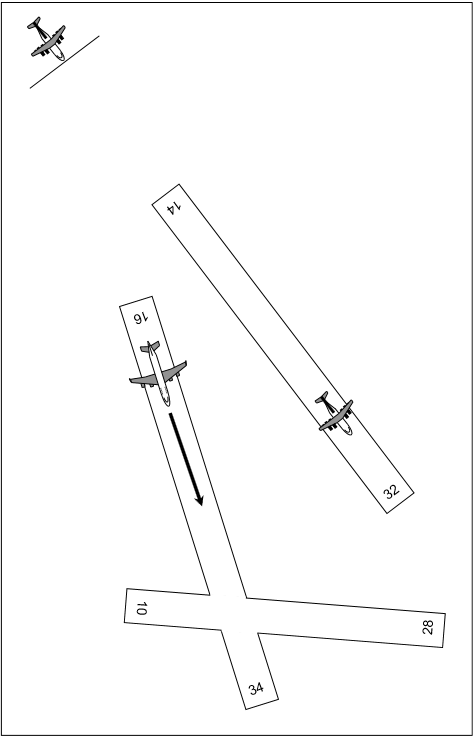 In the event that you have an arrival to the northern runway and a departure from the southern runway that would use a northern Standard Instrument Departure, such as the ANKER6S Departure, you could instruct the aircraft on the departure to maintain runway track or continue on a heading to establish separation between both aircraft. Tower and Approach controllers develop a contingency plan when working with arrivals and departures in their head, which they can quickly deploy to establish and maintain separation by using standard procedures or vectors. 1The source I am providing here is a simulation resource. While the charts are as close to the real-world counterpart as possible, they are not to be used for real-world aviation, but will serve their purpose for visually supporting the answer and are easily accessible. Also a big Problem exists at Zurich Airport where they must wait until a Landing on 14 is completed before they can give start-clearance on 16. This is due to the problem if an Airplane wants to land on 14 must make a go-around and the plane on 16 starts simultaneous, a possibility of a conflict can occur in mid-air. Out of a Pilot Briefing: All SID out of runway 16 describes shortly after airborne a left turn to avoid noise emissions over the city of Zurich. This procedure often causes difficulties because it is hard to integrate in the FMS. Therefore, we recommend you to fly that left turn manually or with the heading function of the autopilot. Take caution to not turn right! The SIDs out of runway 34 is more or less a long left turn and normally no problem for the FMS. Stay on the Tower frequency until advised. Not the answer you're looking for? Browse other questions tagged safety runways go-around parallel-runways or ask your own question. How are the runways operated at Toronto Pearson?